Design your custom house, shop for raw materials, build your dwelling and decorate the interior to your liking, then unveil your creation to the neighborhood! 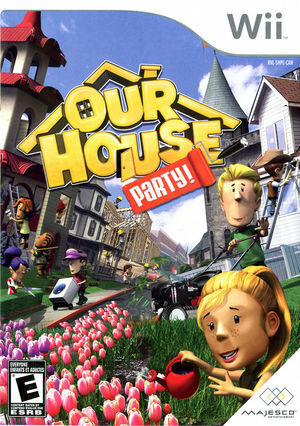 In Our House: Party!, you and your friends will race against the clock and each other to buy the best materials in the ultimate home improvement store! But that's only half the fun because after the mad rush, you'll construct your dream house with your purchases. The graph below charts the compatibility with Our House: Party! since Dolphin's 2.0 release, listing revisions only where a compatibility change occurred. This page was last edited on 13 January 2018, at 09:29.